Was going to go for 18" volks (gold) but these came up at a good price. Happy enough. Cheers for the sideskirts, spot on! How is she coming on? Well, its up at glenburgie getting my engine/drivetrain put back in with some nice new poly bushes all round. Should be back at the end of the week with a bit of luck then that gives me 2 weeks before i go back to work. Engine needs taken out and sent down to Agra to get the bores honed for new pistons, new bearings fitted, polish the crank and have it all balanced. Suspension and brakes are getting a bit of an overhaul aswell. Back on the 21st of July for another 4 weeks. Figure out how to put a scooby engine back together and hopefull should see the car ready for mapping and setting up by the end of it, fingers crossed. Then all it needs is a cage, a set of 17"'s with sticky tyres and it should be good to go for next season up the hill's. A lot of work but looking forward to it and the end result will be worth it. Maybe a bit of driver tuition somewhere aswell wouldnt be a bad idea! I am Happy with mine at the moment nothing I want to change yet not sure how long that will last though. the handling is sorted thanks to whiteline, and enough power for now. Going to get the headders ported the rest has been done the a quick map tweek and thats it for a while. Will have a spare set of std headers you can take away if you want. It'll save the car being off the road whilst they get ported. Should be off the car by the end of next week hopefully. Power Junkie - Thats near enough it! minus the nice wheels,clear repeaters and quads, really can't wait now! Might get him to check out my hks headers. There's a ridge in the pipes at the flange, as if its a double pipe. Expected better of HKS. Doug, Russell has the stuff to sort them out, worth giving him a try. Spoke to Russ the other week about them and yes they could do with a bit of porting. I'll need to get a couple of new 'bit's' since they're stainless. Don't think the alloy bits will be any good! 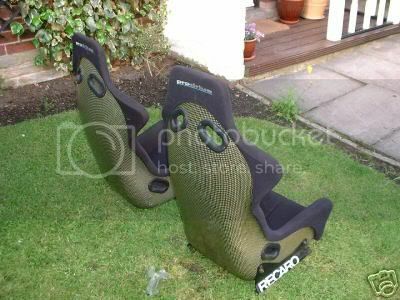 Bought myslef a pair of prodrive recaro buckets (profi spa) the other day to keep my **** (and passenger's...mother? ) firmly planted in the seat. Question is, what do i do with the v.ltd's?? Keep them or sell them? Think you've had this dilema before Si and i told you to keep 'em. I'm thinkin' of sellin 'em..
Where did you buy those Prodrive seats from? Fleabay of all places! Have been keeping an eye out for ages. You also get sparco prodrive carbon seats. Think they're just the manufacturers seat sold by prodrive with their logo embossed on them. 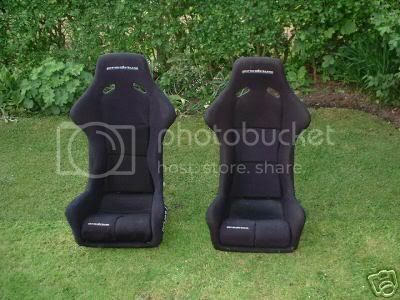 You can get these one's from Demon Tweeks, albeit with out the Prodrive logo's. Look for Profi SP-A. Si, not seen much activity from you on the snet since you were thinking of selling....change of plans maybe? Last edited by doug2507; 07 June 2006 at 09:21 PM. Totally understand. I paid a good bit more for mine than the current market value as i'm sure you did also. I'd be gutted to sell it for what its worth now in std form. Its a shame the markets bottomed out. Good for new buyers though i suppose. Out of all of the classics the ver.6 ltd r's and ra's i would pressume are the most sought after. (excluding 22B). With a bit of luck they'll start holding their value and maybe go up a few quid in years to come. No plans to sell mine in the next few years anyway and holding onto all the original bits to put it back to std if needed. What ECU did you go for? The slippery slope has started. It's like a can of pringles, just a little more expensive! I reckon you should go mad. The body's done now get the drivetrain sorted! Drop a 2.5 in and you'll wander why you hadn't done it already. Well i'm away overseas again on Fri so the rebuild's just going to have to wait till the end of July/Aug. Getting it all done in four weeks is just not long enough for a novice like me so thankfully i've secured a nice big garage in at my old mans premesis for working on it come winter. Fingers crossed it'll be ready for mapping/setting up on my easter hol's next year. Sounds like a long way off but time fly's. Don't think i'll be taking it up the hill's till there's a new box on the horizon as i dont really want to break the one thats in. Better start saving my pocket money! I do plan to be pro-active in the scooby world though and will endeavour to go to as many events as i can when i'm home. With a bit of luck we might have them parked side by side at some point! That would be cool I have storage sorted for the winter its going away this Year. Id like the 2.5 and 6 speed gearbox. To be honest i cant really see me having the heart to sell it now, its part of the family. To be honest i cant really see me having the heart to sell it now, its part of the family. I've noticed that my V5 Type-R STi has went through a set of rear tyres in 2000 miles of town driving. The tyres were Toyo T1-R's. Is this a normal thing for a Type-R? I have the diff set back all the time. My front tyres have plenty of grip left and i put them on at the same time. The rear tyres wore evenly suggesting that its not the camber. I dont drive the car hard either. I tried speaking to Toyo Customer Services but they aint't interested! hey ya fellas, im new to the forum... sorry to jump in but jus wanted to post a couple of pics. Somebody said to me that they felt there was a noticable whine from the rear end of my Type-R. Not a tyre whine but they thought it was a diff whine They heard it more as I slowed at a carpark exit. I wonder if this could be causing my rear Toyo T1R tyres to be needing replaced after only 2000miles? im shortly going to get my apexi fc and commander fitted and mapped , before i do im getting a new fuel pump can anyone recommend what injectors to upgrade to or stay with the type r standards? anybody had an apexi ecu upgrade how much benefit did you get????? cool cars was signed under Daniel-S but now Bat-Fink and still think this is an awesome thread. What other mods have you got and what further mods are planned? Have you a goal that you are aiming at? I've a PFC & Commander on my Type R, very good bit of kit for the money. Will make the power delivery much better. Get your chosen mapper to talk you through how to use the Commander. Just out of interest, who will be doing the mapping?